Maximize your stay in Half Moon Bay by finding the perfect activities for leisure and play. Half Moon Bay is a hidden jewel just a few miles away San Francisco. Here are a few unique and special activities you can do here! Alvaro Jaramillo, known to many as a well-respected field birder and all-around top-man and owner of Alvaro’s Adventure, runs several California pelagic trips throughout the year. Experience seabirding with Alvaro’s Adventure as they will be having several spring trips this year! Check out their site here for more information. Witness a a spectacle that’s unlike any other in Ano Nuevo State Park where hundreds of elephant seals of all sizes gather to fight, mate, give birth or just lay around. There are guided tours conducted by volunteer naturalists, who explain the goings-on and keep the elephants seals and humans safe from each other. If you’re lucky, you will be able to witness a female giving birth to a pup or a skirmish battle between two males. See the beauty of Half Moon Bay through the eyes of a real coastal native and explore the natural environment and culture in a way very few people ever do. Half Moon Bay Adventures offer unique tours and activities custom tailored to your own specific interests and needs. Know more about their adventures here. Fitzgerald Marine Reserve is a rocky marine reserve in California located just north of Pillar Point Harbor and Mavericksin the San Mateo County community of Moss Beach. It hosts a living community of marine life that is of great interest to visitors and naturalists alike. You’ll be able to see a variety of seaweed, crabs, sponges, seastars, mollusks, and fish here in Fitzgerald Marine Reserve. It’s a beautiful but fragile complex full of educational value. Know more about the place here. Located just a short drive from San Francisco, Half Moon Bay Golf Links radiates stately ambiance in a Georgian revival estate and 36 holes of oceanfront golf. Golf enthusiast will surely enjoy gentle ocean breezes that inspire the senses and the game. The Purisima Creek Redwoods Open Space Preserve is located on the western slopes of historic Kings Mountain in Woodside, California overlooking Half Moon Bay. 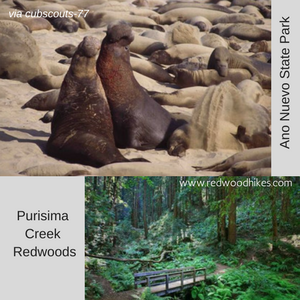 The open space features not only redwoods, but ferns, wildflowers, coastal scrub, several babbling brooks and even free maps for trekkers. Dogs aren’t allowed in the area so just leave your furry friends somewhere comfortable (not your car!). Located in the picturesque hills of Half Moon Bay, La Nebbia Winery is the perfect place to take a sip of wine or two and relax. The place features award-winning wines, great food and a an awesome place to gather with good friends, old or new.